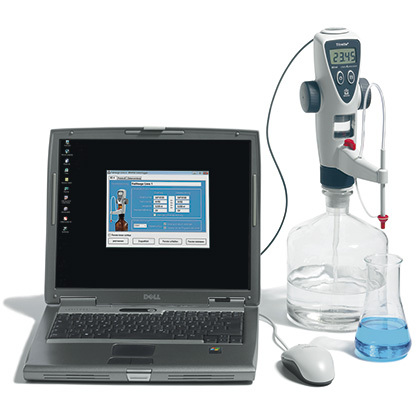 Product and ordering information for the Titrette bottletop burette with Class A precision for fast, easy and accurate titration. 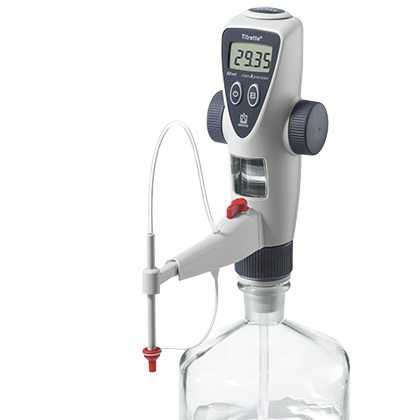 The Titrette® bottletop burette is supplied with: 45mm thread, telescoping filling tube (170-330mm), recirculation tube, 2 batteries (AAA/UM4/LR03), 3 bottletop adapters, 2 amber colored light shield inspection windows, performance certificate, operating manual, and one-year warranty. Additionally included with RS232 interface: 2m interface cable (9-pin, sub-D plug connector), CD (driver software and open RS232 communication protocol). Why do the battery compartments on my Titrette® have silicone covers? These covers help protect the battery contacts from corrosion. Do I need to fill the entire cylinder? No, you do not. You only need to fill the cylinder as much as you think will be necessary. Can I change the battery on my Titrette®? Yes. The Titrette® uses standard AAA alkaline batteries. The Titrette® looks like some sort of fancy digital dispenser. Can I use it to for dispensing applications? It's not the right tool for the job. The Dispensette® is designed to dispense preset volumes of liquids. The Titrette® is designed for titration - dispensing liquids whose exact volume is not known until the endpoint is reached, upon which time the dispensed volume is recorded by the end user. It is possible to repetitively dispense compatible liquids with the Titrette®, but it is not a convenient way to do so. Which position should I leave the Titrette® piston between titrations? When the Titrette® is left idle between titrations, the piston should be left in the uppermost position to reduce crystal formation. This is particularly important when using alcoholic potassium hydroxide as a titrant. Why would I need a drying tube and how do I install one? A drying tube provides a single path for air to entering the bottle to displace the liquid leaving. By forcing all air through the drying tube, CO2 (carbon dioxide) and/or moisture can be absorbed out, to keep it from degrading titrants that are sensitive to these things. To fill the drying tube, remove the cap and place a small wad of cotton in the bottom of the tube to keep the drying reagent inside. Add the drying reagent to the tube, and add another wad of cotton to keep the drying reagent in place. To install the drying tube, first wrap the threads of the tube with PTFE tape, available at any hardware store, in the plumbing section. Remove the accessory port cover that is on the other side of the valve block from the discharge tube. Use the tool provided, the two metal pins will fit into the cover, and it will unscrew. Screw in the drying tube. I have a 25mL Titrette®. Can I titrate more than 25mL? Yes, you can. 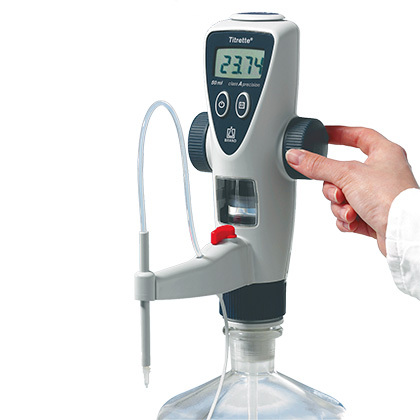 Simply rotate the handwheels backward to fill the instrument, and continue titrating. The instrument display does not increment when filling the instrument. In the middle of titration, I noticed that there were bubbles in my cylinder. Is there any way to purge them? Yes. Press the "pause" button on the front of the instrument to keep the counter from incrementing, and turn the priming valve perpendicular to the titrating tube. You can then recirculate and prime the cylinder. When you're ready to titrate, turn the valve in line with the titrating tube, and push the pause button again to get back into titration mode. Should I buy a 25mL or a 50mL Titrette®? It depends on your needs. The 50mL Titrette® delivers twice as much volume with the same amount of turning of the handwheels as the 25mL model. So, if you do small volume titrations, you would want the 25mL model, as you can titrate slower and with finer control. If the volumes you are titrating are larger, the 50mL model will allow you to deliver more titrant quicker. The resolution is the same on both models - 1µL. The catalog mentions that dispensers for strongly crystallizing liquids or fuming acids and bases are available. What are they? They are the Dispensette® dispensers. These instruments are much more resistant to concentrated acids and bases. Concentrated acids and bases are generally not good reagents for titration. Is the Titrette® a Class A burette? Strictly speaking, no. Neither ASTM nor ISO has yet created a "Class A" designation for bottletop burettes. The Titrette® does, however, meet the error limits or volumetric tolerances required for Class A glass burettes per DIN EN ISO 385 and ASTM E287. So, while it's technically not a "Class A" burette, the results obtained with a Titrette® should be as accurate as one performed with a Class A glass burette of the same nominal capacity. The instrument should not be autoclaved! The instrument should not be used in an aggressive atmosphere (e.g., HCl fumes). Titrating tubes - Replacement titrating tubes feature an integrated discharge and recirculation valve. Telescoping Filling Tubes - Made from FEP, telescoping filling tubes are adjustable to maximize reagent use in most reagent bottles. Dispensing cylinder with valve head and piston head - Both the dispensing cylinder and piston head are easily replaced in the lab. Drying tube - Protects moisture-sensitive titrants (not supplied with drying agent).